The decision to put the Fraser Coast’s water and sewerage infrastructure and servicing back into total council control is a major step backwards, says Tim Waldron who ran Wide Bay Water Corporation for 10 years. “You should never move something efficient into something less efficient such as a council-local government-style entity and that’s what’s happening,” Mr Waldron said. TWO new overtaking lanes have opened on the Bruce Hwy between Howard and Childers just in time for the busy Christmas break. Measuring 1.3kms each, the overtaking lanes located near Pig Creek and the Cherwell River are aimed at reducing the number of risky overtaking incidents. The timing of these lanes comes at a good time, with traffic set to increase along this stretch of the Bruce Hwy during the holiday period. On an average day, the stretch between Howard and Childers sees more than 7000 vehicles a day – 21% of which are heavy vehicles. The Federal Government funded the overtaking lanes as part of its $440 million Bruce Hwy Safety Package, which is dedicated to fixing black spots, providing more overtaking opportunities and improving driving conditions along the highway. Next year work will begin on more overtaking lanes at Bauple, Torbanlea and Wallaville. Commercial premises were left with serious damage after a fire broke out in William St, Howard cafe complex the Fraser Coast Qld about 7.50pm on Sunday. Authorities were alerted by 000 caller reporting they had seen flames coming from the buildings and that they had heard some kind of explosion. Crews from the Maryborough fire station were first on the scene, followed by crews from Childers, Craignish and members of the Howard rural fire brigade. The firefighters had to enter one shop wearing breathing apparatus in order to locate and remove gas cylinders which were inside the property. It took two hours for firefighters to extinguish the blaze. The stores affected included the Coalfield Cafe, a veterinary surgery and a home brew store. The fire is believed to have started in one shop and spread to the others but investigations are still underway to determine the cause of the blaze and where it started. 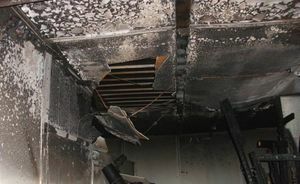 All three stores have been affected by fire and smoke damage. FISH are still dying in the Burrum River while Wide Bay Water Corporation dithers over a design for a fishway on the No 1 dam at Howard. Eight years after Lenthalls Dam was raised, on the condition that a new fishway be built, a detailled design has still not been produced. The upcoming change in the water body’s corporate structure has also put a hitch in proceedings. WBWC acting chief executive officer Garry Storch said they did not want to “take a decision without talking to the council about what they would like to do with it”. “We’ll be taking it up with them in the next week or two as to how they’d like to proceed,” he said. Mr Storch said they had not been satisfied that the designs they had looked at were going to work appropriately. “We’ve got to make sure it’s not a white elephant,” he said. “We’ve got to judge it against cost. Mr Storch said it was difficult to judge the success of a fishway and they had looked at designs but had not come to any conclusions. But environmentalist Graham Berry, who has been involved in the fishway discussions all the way along, said a WBWC manager told the council’s environmental advisory committee in February that the Burrum fish ladder was at the detailed design stage and tenders would be called in May or June for construction to be completed in 2013. He said even though installing a new fishway was a condition of raising Lenthalls Dam in 2004, no timeframe was attached. Meanwhile, throughout September and October, observers noted a steady stream of bass dying in the river’s tidal saltwater near the No 1 dam because the fish were unable to get back into the freshwater via the existing fish ladder after spawning. Way back in 2008, the Greater Mary Association criticised the water body was for its “tardiness” in building the fishway. At the time, water CEO Tim Waldron said it would be easy to build a large concrete structure in the middle of the river that didn’t work. “We do not want to build something that is not going to work,” he said. In September, 2010, WBWC acting CEO Peter Care said $3.2 million had been set aside to build the new fishway to ensure it was completed before the end of the 2012-13 financial year. Mr Care said the fishway benefits included improving, or allowing, adult fish – particularly Australian bass and barramundi that lived in the freshwater reaches of the Burrum system but moved into the saltwater to breed – access to and from spawning habitats, the dispersal of juvenile fish such as barramundi and mullet to new habitats, access to feeding habitats, the recolonisation of habitats and access to and from refuge areas during droughts or floods. “We are committed to improving the health of our waterways and our environment department is working closely with stakeholders to ensure a beneficial outcome for fish stocks and habitats,” he said at the time. Mr Berry said he was a little frustrated by the delay in installing a new fishway but was confident it would be built, “it’s just a matter of when”. 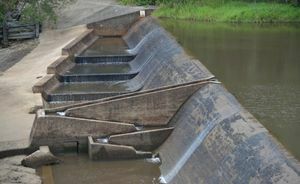 THE proposed fishladder for the No 1 dam on the Burrum River will be fast forwarded as soon as practical, Fraser Coast Mayor Gerard O’Connell has said. A condition of raising Lenthalls Dam eight years ago was that a new fishway be built and Wide Bay Water Corporation committed $3.2 million to the project in 2010 with the aim of completing it by June next year. But a detailed design has not yet been produced and with the council in the process of resuming control of the water body, the future of the project seemed in doubt. However Cr O’Connell said the council and WBW had not met specifically to discuss the fish ladder but “the project remains a focus and will be progressed as soon as possible”. “It is one of a raft of projects being undertaken by the water corporation that have been talked about as the corporation transitions to a business unit of council,” he said. JULIE Carlton’s Christmas light display stands out, but for different reasons than her River Heads neighbour. Sharing number 45 with Peter and Brenda Bowman, Ms Carlton admitted the red-neon display was not the trio’s only contribution to spreading the festive cheer. “Everyone comments on it, it’s quite amazing actually everyone laughs at the ditto sign,” Ms Carlton said. LIGHT Up The City best lights winners Sonia, Brett and Samantha Sorensen spent four-and-a-half-months discussing, designing and setting up their display. With help from neighbours Julie Carlton, and Peter and Brenda Bowman, the 47 Turnstone Boulevard River Heads exhibit deserved every letter of the word “remarkable”. The colourful Christmas celebration even had a slice of humour, with Ms Carlton setting up a neon “ditto” sign on her neighbouring fence, pointing to the winning house. Ms Carlton said the neighbours had formed a special relationship in the past four years as they worked together on growing the display. “Everyone comments on it, it’s quite amazing – and everyone laughs at the ditto sign too,” Ms Carlton said. The neighbours have already been discussing 2013’s display, talking about adding music in the hope of making the showing bigger and better. As for the other awards in the 2012 Light Up The City, they were evenly spread throughout the region. Howard’s Vivienne Smith won the award for most energy efficient display. Down the street from her in Howard, the Patersons, claimed best first-time entrants. HOMEOWNERS with colourful Christmas light displays are welcoming visitors to soak up the festive atmosphere in their neighbourhoods. The attached maps of homes with elaborate Christmas light displays will allow lovers of the jolly season to chart a course through the twinkling lights in Hervey Bay, Maryborough and surrounding areas. Colton mine in limbo as company awaits govt approvals. This is no surprise as per my earlier comments in this site. Some 75 children at Howard State School will receive new school shoes for next year, after a donation from the Shoes and Socks 4 Kids program. The program was a result of more than year’s research by the charity, which spoke to schools and teachers to find out what the most important and urgent needs of disadvantaged children were. Howard State School principal David McGucken said the answer to what kids needed was unusually simple, with basic necessities such as school shoes high on the list of priorities. “It’s nice to get something so useful,” he said. Mr McGucken said the new shoes would be handed out next year to the students who needed them most. Pauline Preston, managing director of the Brighter Future 4 Kids Foundation, said it was shocking to hear from teachers across the state about the effects of poverty on students. “This program ensures children will go to school without the stigma of having no shoes, increasing school attendance, reducing ill health and reducing school bullying,” she said. Ms Preston said the donation to Howard was made possible thanks to the support of organisations such as the Rali Foundation and Star Track Express, which generously delivered all the shoes and socks for free. For more information on the program, go to brighterfuture4kids.org.au.